Overcoming the French language barrier with Theatre in Paris: "Cyrano de Bergerac"
Tears welled up within me as I watched the final scene between Roxanne and Cyrano de Bergerac, the once swashbuckling hero now diminished by his injuries, unfold onstage. If it wouldn't have been for the young girl and her grandmother perched on the edges of their seats next to me, I would have reached inside my purse for a tissue. But I didn't want to disturb them and ruin the moment. It was too intense. Stepping into the romantic seventeenth-century world of Cyrano de Bergerac would have been unimaginable a few weeks ago. My French, which is by no means fluent, isn't up to the task of following Edmond Rostand's play eloquently written in alexandrines, French heroic verse of twelve syllables. In a move as brilliant as Cyrano's sword fighting, Theatre in Paris has completely eliminated the most daunting barrier between foreign audiences and the French capital's theatrical performances. The language. 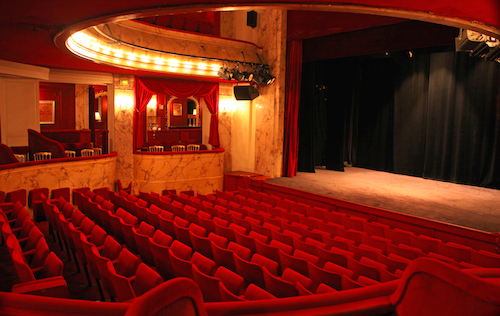 Inspired by their desire to make an array of wonderful French plays accessible to visitors, Theatre in Paris's productions feature English surtitles. To ensure the best possible experience for its customers from abroad, they guarantee seats with a clear view of the surtitles projected above the stage and a program in English. An introduction to the play is given in English prior to each performance, and visitors are invited to meet with the cast and producers after the play, subject to availability. Much more than a theatrical experience, my afternoon at the Théâtre Michel was a cultural revelation. The theatre, with its Italianate style, provided easy viewing of the other audience members as well as the stage. Since it was Wednesday afternoon, the official midweek break from school, there were quite a few children accompanied by their grandparents. Initially fearing that the older generation had miscalculated their grandchildren's ability to remain focused on Cyrano, Roxane and Christian's tangled love triangle, I was reassured as soon as the performance started. The actors' exceptional talent mesmerized the entire audience, while the dramatic notes played on Petr Ruzicka's violin beautifully portrayed the unspoken torment inside Cyrano's mind. Just as Shakespeare's plays have left an indelible mark on Anglophones, Edmond Rostand's verse and his complex character, Cyrano, are legendary. They have passed through the centuries and helped define who the French are today. Don't miss this rare opportunity to see Cyrano de Bergerac in French with English surtitles. Final performances of Cyrano de Bergerac: Sun 4 May 6:30pm; Wed 7 May 3:30pm; Sun 11 May 1:30pm. Next on the program is an outstanding theatrical and musical version of the La Flûte Enchantée (The Magic Flute) at the Théâtre des Variétés. There will be 15 performances from 26 June to 10 July, every day at 7:30pm, as well as Sat and Sun at 3:30pm. If you're unable to watch Cyrano de Bergerac in Paris, Gérard Depardieu's performance in the 1990 movie Cyrano de Bergerac won numerous awards, including two at the Cannes Film Festival, a Golden Globe, an Academy Award and four BAFTAs.